For some time now I have been experimenting with plenty-free baking – as in grain free, nut free, lactose free, egg free and of course, always, sugar free. 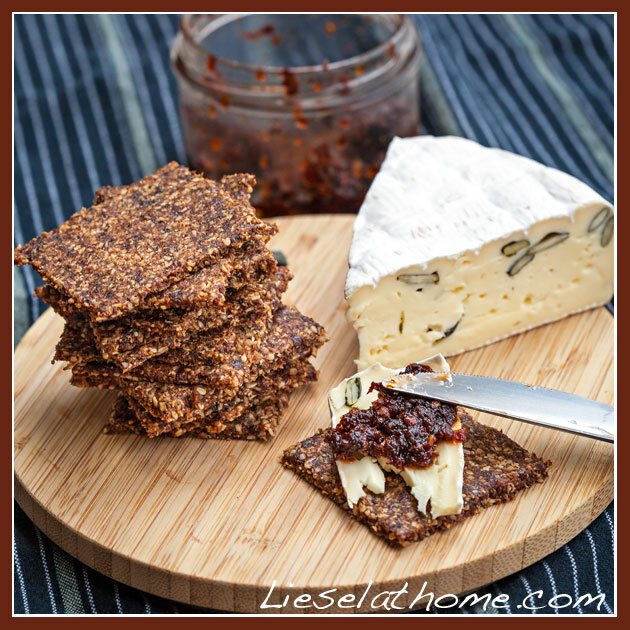 These crackers happened in one of those experiments and ended up being the perfect semi-sweet cracker to go with brie cheese. But then – if you are vegan or just don’t like brie, feel free to eat them with something else or without any topping at all. They are delicious as they are too! 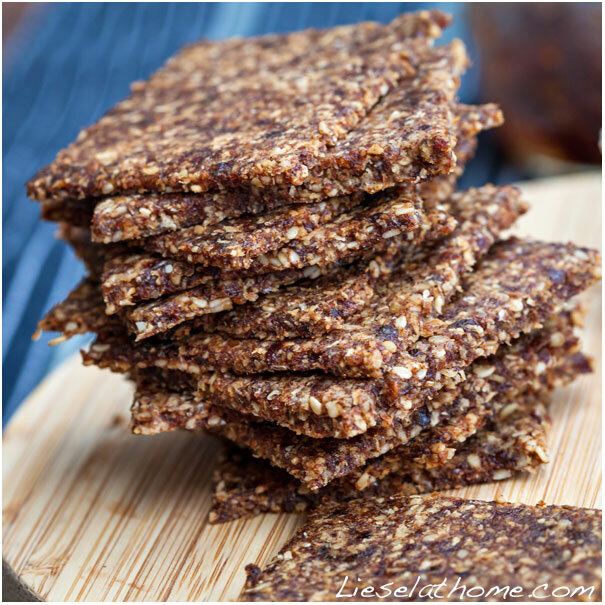 The classic grain free cracker is often based on a mix of ground and whole seeds and I have a few other recipes for them on the blog, like these salty ones or these chocolaty ones. This time I wanted to experiment with dried dates. 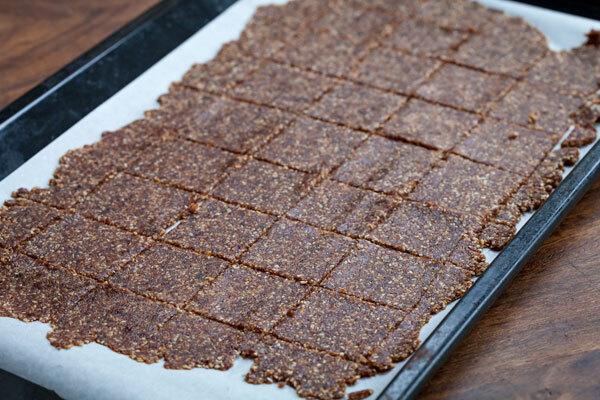 I have this amazing warm, funny, smart and kind Pilates instructor who is also a dear friend, and who brings me the most wonderful dried dates from her home country Israel and they really spike my creativity when it comes to sweet baking. The dates add sweetness and a chewy texture to these crackers that mix so well with cheese – and wine! I’m in heaven! 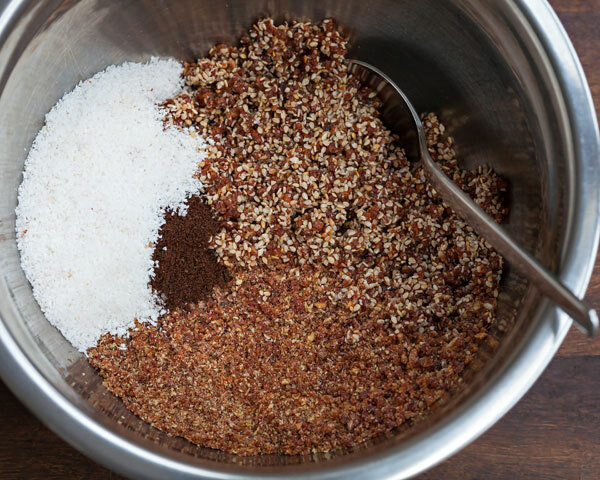 I do this by first grinding the flax seeds in a mixer to a fine powder – then adding in half of the dates, and keep grinding until it turns into a crumble. The other half of the dates I mix with the sesame seeds, again until it resembles a crumble. 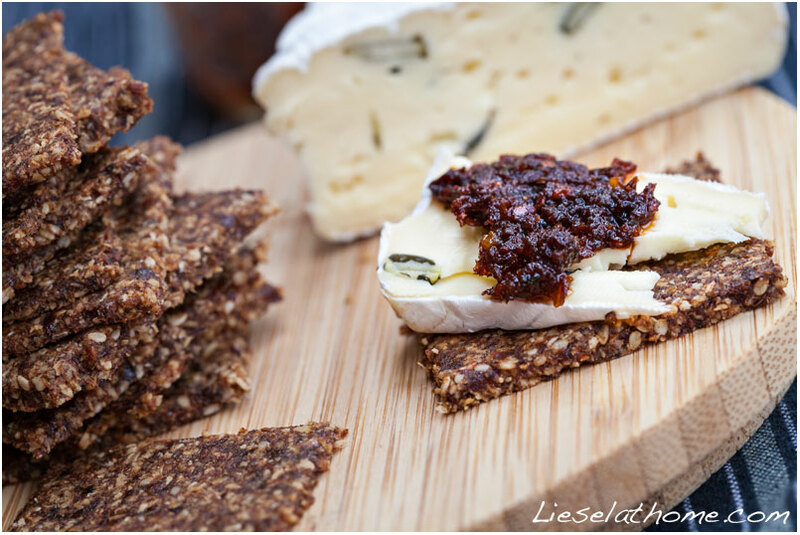 Top left is the shredded coconut, top right is sesame seeds with dates and at the bottom of the picture is the ground flax with dates – you see the crumbly texture. Just use a spoon to mix it all together until you have a dough. Roll it out between two sheets of parchment paper (one under the dough and one over) until fairly flat. I use a wine bottle to roll, and from all the crackers I’ve made these last days it is starting to look like a very cool vintage bottle by now – the label all full of dark stains :-). Then cut the flat dough into squares before placing the baking tray in the (cold) oven. Turn oven on to 160 C (320 F) and set a timer to 35 minutes. Once done, get the tray out, let the crackers cool down and then break them into pieces. As mentioned above I love to eat them with a slice of brie cheese (this version on the picture has pumpkin seeds added) and top it off with this amazing tomato paste. The tomato paste thingy I made by pulsing a package of dried tomatoes (100g) in my mixer until they crumbled to pieces, then adding a small clove of garlic, salt and olive oil (3-4 tbsp.) and pulsing some more. Taste, and possibly add more salt and / or olive oil. I keep it in a glass jar and add this to anything you would add pesto to – and more.